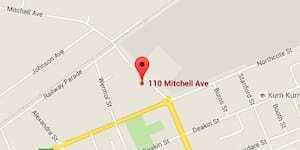 We manufacture certified fire doors for all industrial, commercial, and residential applications. If you have clients who require fire doors for an industrial or commercial project, you know you cannot go just anywhere to find the right doors. Fire doors are designed to keep a property secure in the event of a natural disaster or unexpected incident, so it is important to be able to offer your clients the high-quality doors they require. At Spartan Doors, we can provide fire doors that you will be happy to offer your clients for their industrial or commercial applications. At Spartan Doors, we manufacture fire doors that are ideal for use in a number of internal and external settings. These multi-purpose doors are access doors with a fire-resistant vermiculite core and are finished with timber sheets and internal edge strips to provide maximum security. 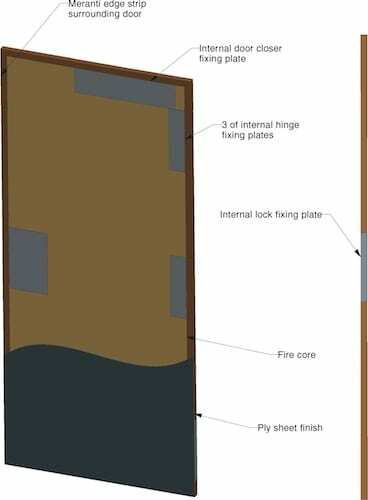 Our fire doors come with framing options, depending upon whether they are single or double width and the direction in which the door will swing open. Although the standard finish for your fire doors is ply sheet, different finishes may be chosen among MDF, Duracote, and Veneer. Additionally, if your client requires increased durability and security, we can use metal sheets with thicknesses up to 1.5mm. You may also wish to mention our high-quality steel door frames as an excellent addition, depending upon your client’s application and usage. 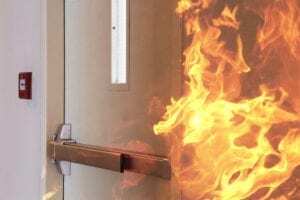 Our steel door frames have an excellent fire rating and offer complete fire protection. If you would like more information about our fire doors and other customisable door options, contact us at Spartan Doors for more information. 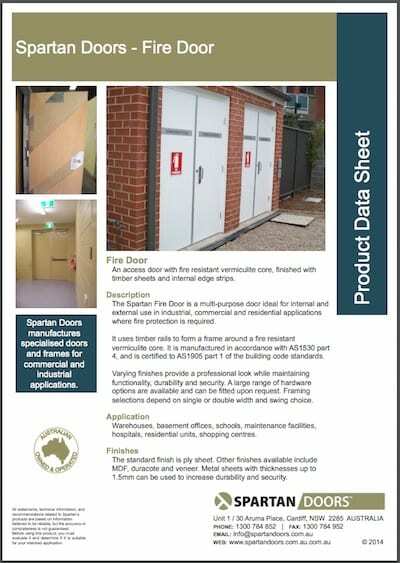 Here at Spartan Doors, we provide the highest quality fire doors to help increase security at your home, office, or warehouse in Sydney, Newcastle, Melbourne, and Brisbane, Australia.